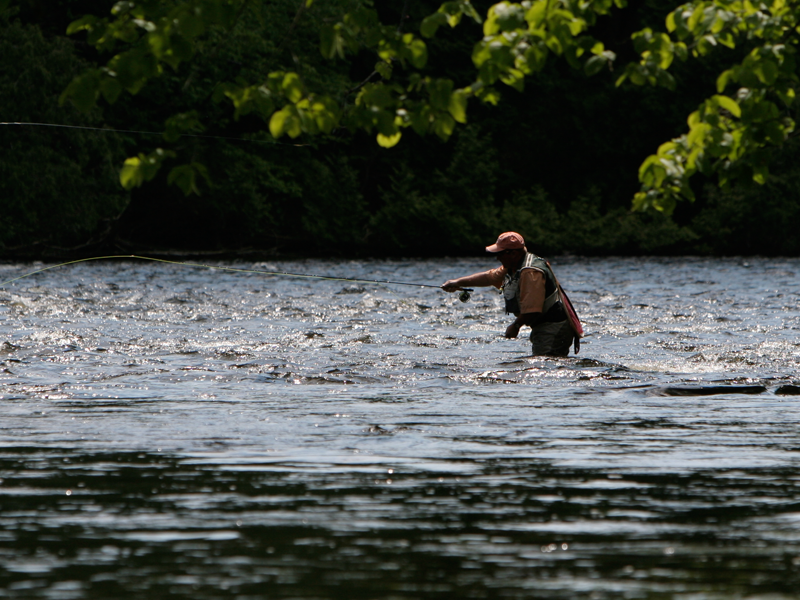 USGS Stream Flow Data keeps Anglers well informed. It is currently popular to criticize the “gub’ment” for just about anything. Unfortunately I cannot blame them for many of the stupid things I’ve done in the last 65 years. In fact, ever since the Department of Defense developed the Internet, I think we should thank it profusely. Without GPS I can think of a lot of people who couldn’t find their butts unless they stuck their hand in their back pocket. Having said that, I must praise the United States Geological Survey for developing a wonderful system of on-line reports that cover just about any waterway in the United States. Through a system of on site monitoring stations a fly fisherman can find out information on conditions on practically any stream or river. How is this possible? Let me give you an example. 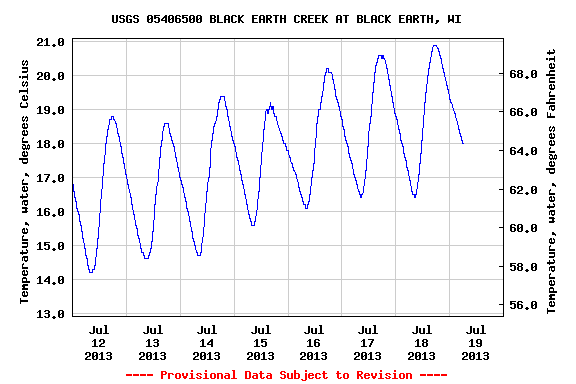 Black Earth Creek, a Wisconsin Class 1 Trout Stream is only 2 hours away from my front door. Last Sunday, my fishing associate and I decided to go there and try for some late rising trout. Wisconsin has been having some serious rain so before we left I checked the weather radar and the USGS table. Sorta like ancients consulting entrails, the omens were good and off we went for a nice evening on stream. There was a surprise when we got to the stream and were scoping it out, right there in the water was the monitoring unit I had consulted only 4 hours earlier. I was able to actually see directly what I had seen in the site data. Here is a report. There were a lot of graphs on the site but these two were pretty useful. 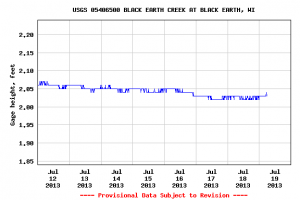 The graph below (Figure #1) shows that stream temperatures rose during the day the began to fall about 5pm to a comfortable trout level. On stream, this was backed up in reality by the fact that about 7:30 fish began to rise and we started to catch them, surprisingly on dry flies like BWO’s. Activity continued after dark. 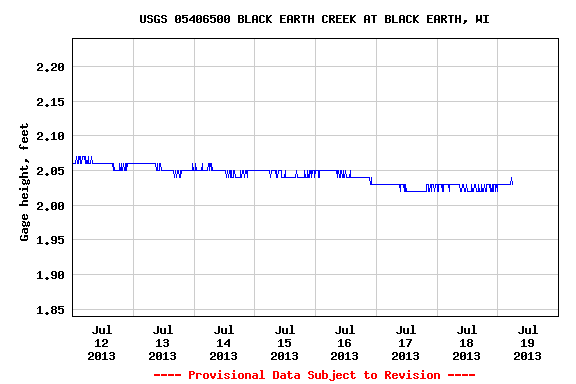 The graph above (Figure #2) showed that the creek was fairly steady in depth and quite wadeable. 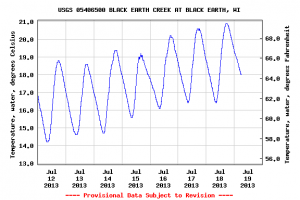 Other charts showed me that flow was constant, clarity was good and that there were no extreme changes for a week. All of this information was confirmed and helped us to decide to (successfully) Go Fishing.